Try combat with a sword against your friends! 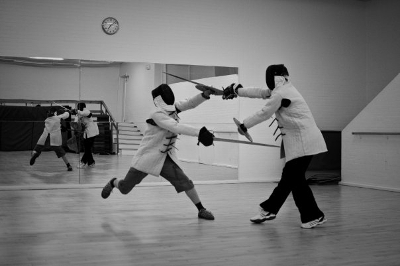 The european swordculture and duelling can be traced back hundreds of years, now you can take part in this ancient tradition as well. We offer bachelor parties, gentleman lodges and other interested groups a unique experience. After a short introduction in safety and using the sword you can engage in a fencing duel against your companions. We have all necessary equipment to make the experience as intense as possible. The swords are not sharp, but made of steel. So it's as close to the real thing as it gets.